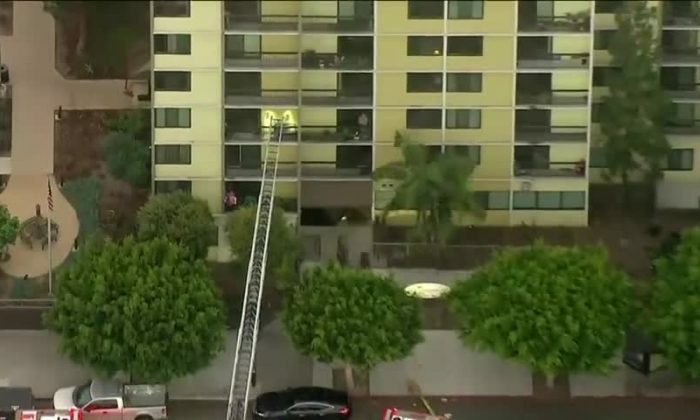 One firefighter was shot and killed and another injured on Monday during an incident at a residential building for seniors in Long Beach, California. The Long Beach Fire Department confirmed the death of fire Captain David Rosa. “It is with deep sadness and tremendous grief that we announce that Captain David Rosa has died from injuries sustained from a gunshot wound he sustained at an emergency incident. Capt. Rosa is a 17 year veteran of our department and is assigned to Station 10,” the department said in a tweet. The shooting took place at around 4 a.m. local time on Monday when the department responded to reports of an explosion and the smell of gasoline in the Covenant Manor senior care facility, Long Beach Fire Chief Mike DuRee told the Los Angeles Times. Rosa and another unnamed firefighter were shot inside the building while trying to see what triggered the building’s sprinkler system. A third person, a civilian, was shot and is expected to survive, according to the Times. Residents told CBS Los Angeles they heard an explosion at the Covenant Manor. “We had two firefighters who were shot,” DuRee told the CBS affiliate. “I’m saddened to report as of right now, fire Capt. Dave Rosa…was killed in the line of duty this morning while he responded to that structure fire.” He said that Rosa leaves behind a wife and two children. A suspect in the shooting was taken into police custody, Long Beach police Sgt. Brad Johnson confirmed to the newspaper. The suspect’s identity was not released, and police have not determined the motive. “We have one person that we believe is partially responsible and he is with investigators currently,” Johnson told CBS Los Angeles. Resident Rick Convay told the station that he was leading a group out of the building when he spotted a man sitting on the stairs with a gun in his hand. Corvay said the group went the other direction before telling police.